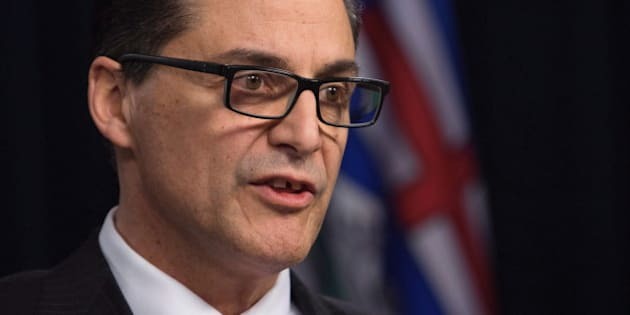 EDMONTON — Alberta's finance minister is reminding a group of businesses seeking tax and wage relief that the province is already the lowest taxed jurisdiction in Canada. Joe Ceci also said Monday the tax changes being implemented by the NDP government won't change that and will put the province on a sounder footing. "We have the lowest taxes overall of any province or territory in this country,'' Ceci told reporters at the legislature. Ceci was reacting to a call from 15 business organizations for Premier Rachel Notley's government to make changes to its tax plan given rising unemployment. The group represents oil and gas, manufacturing, retail and construction businesses. It is seeking a meeting with Notley and her cabinet, but Ceci says he already meets with members of the group. The NDP has hiked corporate taxes last year from 10 per cent to 12 per cent. It also threw out Alberta's 10 per cent flat tax and replaced it with a progressive system with higher taxes paid by higher-income earners. Last year, it hiked the minimum wage by $1 an hour to $11.20 an hour, and remains committed to moving it to $15 an hour by 2018. In the April 14 budget, Albertans will learn the details of a new $3-billion a year carbon tax that begins on Jan. 1. The tax will see prices rise on everything from gas at the pumps to heating and electricity bills. The government says carbon tax rebate money will go back to about 60 per cent of Albertans, with the rest reinvested in green initiatives and public transit. "We needed to change the regressive flat (income) tax, we needed to change the low corporate tax overall. We just raised it two percentage points,'' said Ceci. The business coalition wants an end to future tax increases and a delay in the minimum wage increase. It wants to see the carbon tax become revenue neutral with offsetting tax reductions. The low price of oil is hitting Alberta's economy hard. On Friday, Statistics Canada reported Alberta's jobless rate has risen to 7.9 per cent. "Albertans from all walks of life are experiencing hardships not seen in decades,'' reads the coalition's letter.